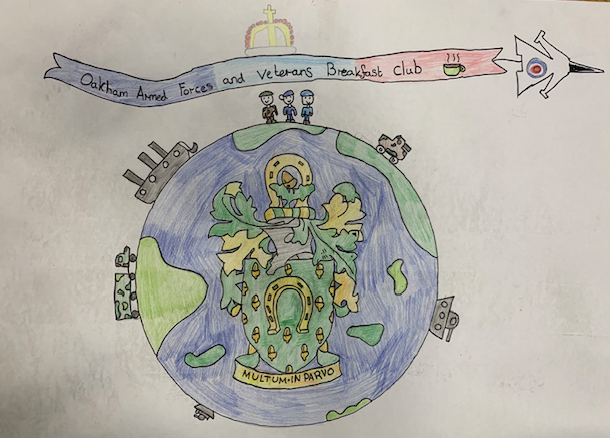 Before Christmas The Oakham Armed Forces Veterans Breakfast Club challenged our children to design a new flag which would be used events for the OAFVBC. The idea was for the children to complete this artistic challenge independently giving it a real sense of achievement for all who had entered. The flags had to encompass all three services and be a reflection of service life whilst championing proudly Rutland all at the same time. The standard of all the work was incredibly high and it has to be said the judging process was so difficult given the volume and quality of work submitted. A panel was devised representing all three services and the final 5 chosen entries were then judged by the public via social media, the response was overwhelming. However there was a unanimous winner, an entry by none other than Alexis De Villiers, who was “shocked but delighted”, to be the winner. Courtesy of Forces Mutual, located on Kendrew Barracks, the Breakfast Club were able to present Alexis with an Amazon Voucher of £50 for her winning entry. Alexis’ design has now been sent of to print and has arrived back in time for the flag to be paraded at Peterborough Cathedral at the celebration of Rutland on Sunday 24 February 2019. Alexis has been kindly invited to carry the flag along with another pupil from the school at that event.